Take the Route 725 exit. Go East on Rt. 725 toward Centerville. Continue on Franklin Street through downtown Centerville, crossing over Rt. 48/Main Street. Centerville High School will be on your right about 1/2 mile. Take the Route 48 (South) exit. Go South on Rt. 48/Far Hills Ave. toward Centerville. Turn left on Franklin Street in downtown Centerville. Centerville High School will be on your right about 1/2 mile. Enter the school and follow the driveway on the right to the rear of the complex. The Performing Arts Center is the large 2 story glass fronted building. There is ample parking close to the main entrance and handicapped accessible parking located on the East and West sides of the Center. 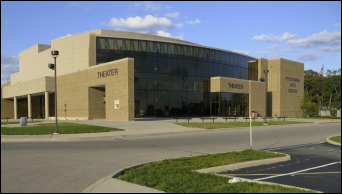 The Centerville Schools' Performing Arts Center opened in December of 2007, featuring a state-of-the-art 1200 seat theatre. It is one of the largest venues in the Dayton area. The Performing Arts Center also contains a dance studio, scene shop, and other support areas. A prominent feature of the PAC is the two-story, glass lobby which is perfect for art exhibits, gatherings, and meetings. We invite you to attend one of the many events held here at the PAC. School concerts, theatre productions, and lectures are held throughout the school year. In addition, the PAC is host to community events such as band concerts, dance recitals, and other musical presentations. 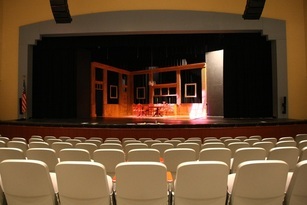 The Central Unit Theatre is an intimate performance space and meeting facility located in the Central Unit of Centerville High School. The facility includes a small stage and seating for 300+ people. The facility can be used for meetings, presentations, banquets and small theatre events.